Made from oil impregnated leather with a rugged texture for maximum wet weather protection. 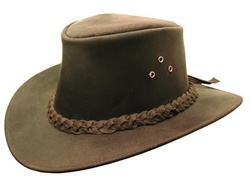 Features a braided hat band. Large crown, medium brim.